Fesmedia Africa, the media project of the Friedrich-Ebert-Stiftung (FES) in Africa, is working towards a political, legal and regulatory framework for the media in African countries, based on human rights law, relevant protocols of the African Union and SADC declarations or other regional standards. Our office is based in Windhoek, Namibia. Question Box is featured as a case study in the latest volume of the fesmedia Africa series: Texting, Tweeting, Mobile Internet - New Platforms for Democratic Debate in Africa Question Box's writeup is excerpted below. We encourage you to download the informative booklet available on FES's website. Internet searching means that finding information mundane, obscure, or fantastically useful is just a few keystrokes away — but not if you're without a connection to the Internet (or can't read), both the norm for many of the world's poor. itwbennett writes "Rose Shuman developed a contraption for this under-served population called Question Box that is essentially a one-step-removed Internet search : 'A villager presses a call button on a physical intercom device, located in their village, which connects them to a trained operator in a nearby town who's sitting in front of a computer attached to the Internet. A question is asked. While the questioner holds, the operator looks up the answer on the Internet and reads it back. All questions and answers are logged. For the villager there is no keyboard to deal with. No complex technology. No literacy issues.' This week, Jon Gosier, of Appfrica, launched a web site called World Wants to Know that displays the QuestionBox questions being asked in real time. As Jon put it, it's allowing 'searching where Google can't.' And providing remarkable insight into the real information needs of off-the-grid populations." Under the tagline 'Realtime Web for the Bottom Billion', a new type of service for farmers is emerging. Piloting in India and Uganda, Question Box "brings information to people who cannot or do not access the Internet directly." It "leaps over illiteracy, computer illiteracy, lack of networks, and language barriers." An app we've been using internally for a long time goes public! Recently, I began thinking about the data we were collecting and of ways to make it more accessible. Because there was a real time-input (people calling the service), I decided I would try to offer a real-time feed of the questions coming in from people who have no computers, sometimes even no phones. How can they not have phones you ask? Well, in our current pilot with Grameen-Uganda, Question Box works by sending people called Community Knowledge Workers into the field to aggregate questions from rural communities. 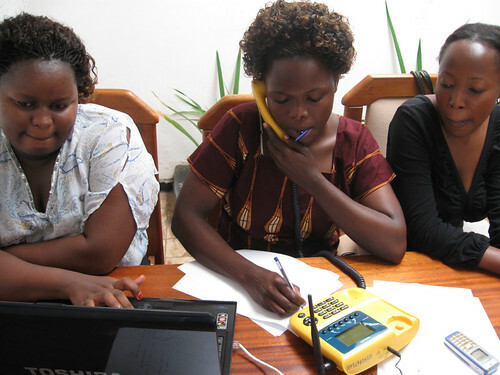 The CKW then dials a call center (located at Appfrica Labs) with operators on standby waiting to look up the answers. As the operators enter a search (complete with the demographic info of the question asker) the application is populated with those queries, as they occur in real-time. If you’ve ever been to Google’s Mountain View campus, they have a monitor displaying search terms as they are being entered by billions of people around the world, this is the same general concept applied to people who normally live their lives far beyond reach of the web. The application is called World Wants to Know or WW2K. It’s an exercise in data visualization and offers insight as to the types of information these populations are interested in. Before you ask what the answers are, we do give them to the callers but to protect their identities as well as the interests of our pilot partners, that information (unfortunately) cannot be shared. Over the next few weeks I hope to add many new visualizations to the site based on the data we’re collecting in India and Uganda. Perhaps, the most exciting aspect of Question Box is that it's the perfect example of cross-cultural solutions to local problems. The Question Box was first piloted in India in a very different form. Actual boxes that were placed on walls. The box has a mobile phone in it that's pre-programmed to dial a specific number (the local QB call center). Users approach the box and push a button that triggers the call. Once connected, they ask an operator a question in their local language and get their answer back in that same language. In India the operators search the internet, they simply place the operators in a place with a good internet connection. But the software solution developed in Uganda offers the opportunity to improve the service in India as well by searching locally focused verticals and logging queries offline instead of relying upon the masssively unfocused world wide web. Likewise, the mobile-solar question box developed in India is an ideal solution for use in Uganda's semi-tropical climate. With these two bottom-of-the-pyramid countries sharing knowledge and experience, there's no limit to the concepts that can be tested and implemented.